Save 15% off Tix at GTS Theatre. USE COUPON CODE - CVB19. GTS THEATRE - We've Got The Shows in 2019. Motown Tribute Show, Elvis Live, Men of Motor City, Michael Bairefoot Comedy Magician, Christmas in Dixie, Redneck Style, Latino Variety Show & More. 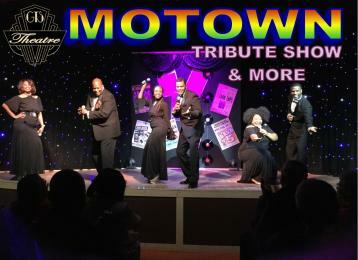 GTS THEATRE - We've Got The Shows - Motown Tribute Show, Beach Party 60's & 70's Show, A Magic Show, Holiday Time Motown Christmas & Crazy Country Christmas. You'll catch your feet tapping, & singing along to hits of the Decades with a live cast of amazing powerhouse performers. #5 In the Top 10 on Tripadvisor. GTS Theatre 1 Mile south of the Airport. Call for reservations.